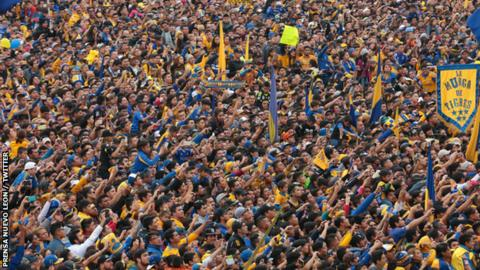 Around 500,000 supporters of Mexican club Tigres UANL took to the streets of Monterrey to celebrate their team's dramatic title win. Tigres, who have former West Ham and Everton striker Enner Valencia in attack, won their sixth league title at the home of city rivals CF Monterrey. Monterrey missed a penalty minutes from the end of the league play-off tie, which Tigres won 2-1. Around half of the city's 1.1 million population took part in the parade. More than 400,000 Tigres fans accompanied the team bus on a tour of Monterrey, in the north east of Mexico, before joining another 100,000 waiting in the city's Explanada de los Heroes. The Apertura championship triumph on Sunday, which followed Thursday's 1-1 draw in the first leg, gave Tigres their third consecutive title and coach Ricardo 'Tuca' Ferretti his sixth winner's medal. After the game Feretti allowed his players to shave off his moustache in celebration.